CHINA: The 401km high-speed line linking Baoji and Lanzhou in northwest China was scheduled to open in July. It bridges the gap between two existing lines to create a high-speed railway linking Xuzhou in eastern China and Urumqi in the northwest, stretching more than 3000km. The line is a key part of China’s high-speed railway network, which is based on a grid of four east-west lines and four north-south lines. This grid has now basically been completed, following rapid construction in the past decade, particularly in the last five years. At the end of 2016, China’s high-speed rail network stood at 22,000km, which is more than all the other high-speed lines currently operating outside of China combined and accounts for about 60% of the world’s total high-speed railway length. The expansion of the network has boosted traffic considerably. Besides these major lines, China is planning some short-distance lines to add to the high-speed network by 2020. According to the revised plan, the total length of high-speed lines will be further extended to reach 38,000km by 2025, and 45,000km by 2030. Chinese high-speed trains carried 1.18 billion passengers in 2016 compared with 961 million in 2015 which itself was a 237% increase on the figure recorded in 2011. On the busiest day last year, a total of 14.4 million people travelled by high-speed train, setting a new Chinese record. China’s first high-speed railway opened in 2002 and by 2013, when the Tianjin - Qinhuangdao line was put into service, the network already exceeded 10,000km. It took just 11 years to go from zero to 10,000km. The rate of construction accelerated during the next three years so that by the time the Zhengzhou - Xuzhou line opened in September 2016, the length of the high-speed network had doubled to exceed 20,000km. High-speed services are popular in China thanks to the short journey times (Table 1), convenience and punctuality, with 98.8% of trains departing on time in 2015 and 95.4% arriving on time. Sales of tickets through the internet are growing rapidly. In 2015, 60.5% of high-speed train tickets were sold online, and by 2016, the proportion had risen to 68.2%. According to a comprehensive transport plan approved earlier this year by the State Council, China’s cabinet, the high-speed rail network will reach 30,000km by 2020. This will effectively double the grid network already created so that there will be eight east-west and eight north-south lines. Some of these arteries will be created by plugging gaps in the existing network, for example, between Ganzhou and Chongqing to create a new east-west line from Xiamen to Chengdu, or by extending existing lines, such as from Harbin to Suifenhe and from Qiqihar to Manzhouli to create a new east-west line in northeastern China, or by extending the Guangzhou - Nanning - Baise line to Kunming. Baotou and Yinchuan - Xi’an - Chongqing - Guiyang - Nanning - Haikou (north-south). When this target has been reached, more than 80% of cities with a population of more than one million will be served by high-speed train. China’s investment in railway fixed assets stood at Yuan 801.5 billion ($US 118bn) in 2016, according to the Ministry of Transport. Fixed asset investment includes capital spent on infrastructure, machinery and other physical assets. This year fixed asset investment will be at the same level as in 2016, with the government setting a target of Yuan 800bn, according to China Railway Corporation (CRC). China plans to invest Yuan 3.5 trillion in railway construction during the 13th Five-Year Plan covering the period 2016-2020. 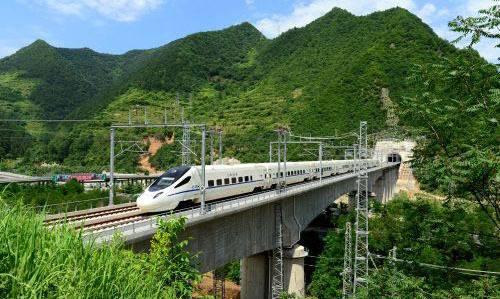 Greater effort will be made to extend the high-speed network in the less-developed western regions of China, according to the country’s medium and long-term railway network development plan, which was revised last year. Although China’s railway has witnessed rapid development in recent years, which has helped to relieve pressure on transport capacity, the network is still insufficient in central and western China, and the government wants to narrow the gap. “Accelerating railway development, particularly investment in the central and western regions, is key for China’s strategy to stabilise growth, adjust economic structure, increase efficient investment and expand consumption,” the plan says. China’s next-generation Fuxing or Rejuvenation high-speed train made its debut on the country’s busiest high-speed route, the Beijing - Shanghai line, in June. The new train, which has been developed from the widely-used Hexiehao (Harmony) train, has a maximum design speed of 400km/h and can operate at 350km/h. Besides the higher speed, it is more spacious, has a longer design lifecycle, and should be more reliable than previous generations of Chinese high-speed trains. China and Indonesia signed an EPC deal in April to build a high-speed rail link between the capital Jakarta and Indonesia’s fourth largest city Bandung. The line, with a maximum design speed of 350km/h, will be operational in three years’ time and will cut the journey time between the two cities from more than three hours to just 40 minutes. The deal was the first full-package overseas high-speed project using Chinese technology, design, engineering, equipment, management and personnel training. Mr Huang Qiang, chief researcher of the China Academy of Railway Sciences, says Chinese high-speed railways boast higher cost performance, stable operation, a shorter construction period and good-quality financing arrangements. China is pushing forward with high-speed railway projects in Russia. CRC, Russian Railways (RZD), Chinese train builder CRRC and a Russian railway company have signed a letter of intent to build a 762km railway between Moscow and Kazan, with a designed maximum speed of 400km/h and an operating speed of 360km/h. China is also actively seeking high-speed railway deals in Malaysia, Britain and the United States as it looks to export its expertise around the world.